At the beginning of every new year, I sell a small batch of calendars featuring my photography to friends and family. There’s a high-quality printer I’ve found who prints exactly what I need, but I recently ran into trouble on their website and needed to contact their customer service team. It was after working hours, so I contacted them using the only option available to me at the time: a quick email detailing my problem. I expected to get a response sometime during the next day with a way to resolve my issue. I didn’t receive an email confirmation of my issue, so I had to trust that my message was delivered to the right people. The next morning, however, there was no response. The day after that, there was still no response. At that point, the delay was going to impact my own “customers,” and I needed to know what was up. I took a few minutes out of my workday to call and was finally able to resolve the issue over the phone. The damage was done. After more than 24 hours had gone by without a response to my first message, my trust had started to erode. I’m willing to do business with them again next year, but before I do, I’ll probably take some time to research other options. If you have a business website, sell your products online (including Amazon or eBay), or have a list of clients who rely on your services, you may already know that quickly responding to emails matters. Your ability to fulfill orders or respond to questions and problems in a timely manner directly impacts your reputation, reviews, and new or repeat business. That’s why we released Analytics, a new feature in Outpost to help your team track average email response times. Analytics will give you the insights you need to help your team be more productive while also improving your customer relationships. What can you track in Outpost? In your Analytics dashboard, you see the average time it takes for your team to respond to incoming emails. You can view this information for all of your mailboxes together, or for each individual mailbox. You can also filter your view by specific date ranges to see how your response times change over time. Analytics by user: This chart and table allows you to see the response time for any individual team member who sent an email response during your report’s selected date range. Analytics by date: This chart and table allows you to view your team’s daily response time during your report’s selected date range. Analytics by time: This chart and table allows you to see how many email responses are distributed across response time thresholds, so you can better understand how your average response time is being calculated. For example, you can see how many messages were responded to in less than 30 minutes, between 30 to 60 minutes, 1 to 2 hours, and so on. Want to see it in action? Log in to your Outpost account, or start your free trial to check it out. Do email response times really matter? 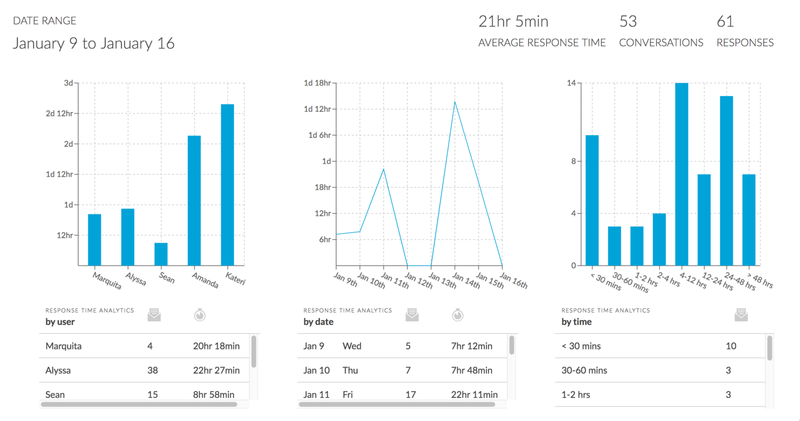 You might be wondering why we built our analytics dashboard around email response time. We’ve found that by measuring and improving the time it takes your team to respond to incoming messages, you can achieve big wins for yourself, your team, your business, and your customers. The average professional spends over 20 hours per week checking, reading, and responding to email. That’s a staggering amount of time that you shouldn’t leave unchecked. If you start tracking your email response time in Outpost, you can begin thinking about how to win back that time. Assign messages to specific members of your team to delegate more efficiently. Use internal notes to cut down on email forward chains (and embarrassing messages getting to the wrong people). Take advantage of email templates to spend less time answer the same questions over and over. Set up “email digest” notifications to remind you to take care of unread messages, or messages that you’ve been assigned. As your team uses Outpost, tracking your average response times together will provide you with clear opportunities for growth and improvement. First, setting a response time goal, or creating an email response time policy, will help affirm customer-centric values for your team. Then, by regularly reviewing average response times with your team, you’ll begin to uncover aspects of your staffing, training, or process that can be improved. For example, let’s say that your team’s average response is longer than 24 hours, and you’d like to cut that in half to 12 hours. There’s a higher volume of incoming emails on Monday and Tuesday, and it ends up affecting how quickly you respond to messages all week. Some of your team members don’t know the answers to the questions they receive and have to spend time getting help from other team members. Your veteran team members have a lot of knowledge but have to request key information from other departments like marketing, sales, or accounting before they can respond. Having more team members focus on responding to emails on Monday and Tuesday. Setting aside dedicated training hours later in the week to help increase your team’s knowledge, and building your website FAQs and email template library. One more real-world example: One of our customers reviewed his team’s response times and realized that his current staff hours were spread evenly throughout the week, even though the majority of his email volume happened during the first half of the week. By reducing work hours on Friday (something they were all in favor of), they were able to use the savings to hire an additional team member to help with the higher email volume earlier in the week and respond to customers more quickly. Regardless of your business’ size, you probably have a few numbers that you’ve identified as key performance indicators (KPIs). These numbers, if improved, contribute to the health of your business. They might be revenue goals, sales goals, marketing goals, or something else. Including average response times as a strategic metric for your business will put an appropriate focus on the relationships you have with your prospects and customers. By valuing your customer’s time, you will begin to see a direct impact on other metrics you’re tracking. Plus, here’s another real-world example: At Palo Alto Software (creators of Outpost), after regularly tracking our interactions with customers, our company was able to identify that inquiries significantly drop between the Christmas and New Year holidays—it’s the seasonal nature of our business. Not many people go looking for small business software the day after Christmas. Based on this information, we decided to try closing our offices during that week, with the exception of having a few members of our Customer Advocacy Team available. By not operating the entire business for a week, we were able to pass those savings on to the small team that agreed to be on call, and the rest of our company got to spend some additional time with friends and family over the holidays. You can’t confidently make company-wide decisions like that unless you’re tracking the data necessary to uncover those opportunities. Finally, the bottom line: Reducing your average response time will delight your customers and increase your revenue. When your customers receive timely—and high-quality—responses from you, you’ll continue building their trust and loyalty. Customers who are loyal to you are more likely to buy from you again and recommend you to others. Repeat business with help acquiring new customers—that sounds pretty great, doesn’t it? What will your email response time goal be? The best email response time is going to depend on the type of business you’re in, but you can’t improve what you aren’t measuring. Start tracking your average email response time in Outpost to determine your benchmark, and then try beating it the next month. Pretty soon you’ll build momentum, and will find the optimal response time that improves productivity and impresses customers. The Analytics feature is available in every Outpost account. You can try Outpost for free and immediately start tracking your response times.